‘P4man’ is an active bitcoin miner and investor with an academic background in economy and IT. He has been a member of the online discussion forum Bitcoin Talk since September, 2011. In this opinion piece, P4man looks at the cryptocurrency market to see if there is a credible investment alternative to bitcoin, focusing this time on XRP, the native token for blockchain startup Ripple’s consensus protocol. I have to admit, I’ve dreaded writing this part of my series. Among investors, Ripple is one the most divisive cryptocurrencies around – it’s either loved or despised, both with equal passion. Even more than ethereum, I believe, it’s misunderstood because it’s so different from bitcoin. But, being number three in market cap (actually number two, but more on that later), I can’t really avoid writing about it. Ripple dates back to 2012. I remember when it was launched, as I was one of the beneficiaries of what I believe was their first public giveaway on Bitcoin Talk forums. If memory serves, I received something like 30,000 XRP tokens (although, I probably cheated using multiple accounts…). Once I received the tokens, I tried out the protocol and tried to understand what it was about. I was equally intrigued and confused by the concept, which was new to me: a peer-to-peer payment network where anyone could issue debt and that was, in essence, currency agnostic. If I had trouble understanding what that even meant, I understood even less how the XRP token fitted in. What was it for? The only explanation that I remember being given at that time, was that it was meant to prevent network spam. A token of which 100 billion exist that serves to “prevent spam” didn’t sound particularly exciting or valuable to me. So, I quickly swapped my free anti-spam tokens for more bitcoin. It wasn’t until much later, when I read Peter Todd’s now infamous analysis on Ripple’s predecessor, Ripplepay, that I began to understand not only what Ripple is, but also what I had only sensed intuitively about the XRP token. To explain, we need to go back in time. Before Ripple, and in fact, before even bitcoin launched, Ripplepay was a peer-to-peer payment network created by Ryan Fugger around 2004. This old website, which for some reason still exists, explains it in very simple terms. In a nutshell, Ripplepay allowed users to issue and swap credit between network participants that trusted each other. Think of it as an online equivalent of someone writing on a Post-it note “good for $50,” then signing it. If you trusted whoever signed that note, then that note would be worth $50. It’s simply an IOU, a concept that forms the basis of how banks operate and create fiat money. In the real world, it’s much easier to create and swap IOUs, or “Post-it notes” between trusting individuals, than it is to design a method for cash payments. With cash payments, you don’t rely on trusting each other, you exchange something of value. Instead of accepting a counterparty risk, the parties need to trust the value of the object they exchange. So, you need some kind of store of value that can’t be easily counterfeited. Something like gold or bank notes (although technically, the latter is also a IOU, only one that is issued by a bank). It’s very similar when you try to digitize it: Ripplepay, as payment system, was a much simpler problem to solve electronically than a digital cash system like bitcoin. First of all, in a payment system, you do not need to worry about double spends; if I issue an IOU to Alice, I can still issue the same amount to Bob, and there is no risk this is somehow the same debt: if I issue it twice, I will just owe both. However, if you allow a (digital) cash asset to be spent twice, this is essentially counterfeiting. In a payment network, there is also no need for a global consensus: Bob doesn’t need to know, or agree with me about how much money I owe to Alice. As long as Bob and I, and Alice and I, agree among each other how much we owe each other, then a local consensus is established, and that’s all thats needed. What you do need in a payment network however, is trust among users. You can’t issue debt to someone who does not trust you. So, you need to set a trust line, or credit limit, that defines to what extend you trust which participant. Trust lines can “ripple” through a network, allowing trading of IOUs with participants you may not know, but with whom you share trusted intermediaries. If Bob and Alice both trust me, Bob could pay Alice with an IOU that I issued to Bob. Besides requiring trust, in a payment system, you are always exposed to counterparty risks. You might have trusted me when I wrote that good for $50 note, but what if I don’t or can’t pay back? Being able to pay electronically without trust, and without counterparty risk, only became possible several years later when Satoshi Nakamoto introduced the world to his solution to this old problem in the form of bitcoin. By using proof-of-work, he created the first real solution for a digital cash system that could store and exchange value, was extremely resilient to counterfeiting, involved no trust and had no counterparty risk. So, a trust-based IOU payment network like Ripplepay, and a trustless digital cash network like bitcoin, are two completely different things, and yet they are actually quite complementary. Ripplepay, for instance, could easily allow the creation and management of bitcoin-based IOUs among trusting users. The electronic equivalent of a “good for 1 BTC” Post-it note. Issuing debt is impossible in bitcoin itself, though certainly useful. A few years after bitcoin was launched, OpenCoin, later Ripple Labs, took over Ripplepay. They completely reworked the protocol. The concept still revolved around managing IOUs, but inspired by bitcoin, they also included a new token called XRP. The inclusion of a cash token, that is not an IOU, automatically means you now need a protection against double spends and thus a global consensus protocol, because now everyone on the network needs to agree about token transactions and ownership. What had been a relatively simple concept now became a very complex one that faced the exact same problems that bitcoin had only just managed to overcome. And there is no free lunch; bitcoin, revolutionary as its concept may have been, had to make significant sacrifices to achieve a global distributed consensus, such as electricity-consuming proof-of-work (mining), high-latency transactions (multiple transaction confirmations) and limited scalability (monolithic blockchain containing every transaction, ever). These were problems that a distributed payment network shouldn’t have. Ripple tried to overcome these challenges in a different way than bitcoin. Instead of using proof-of-work, it relied on a new, unproven consensus protocol. This protocol requires users to extend trust to validating servers that produce this consensus. Relying on trust, rather than proof-of-work, kind of makes sense for Ripple, because you need similar trust relationships anyway for IOUs to work. But this means that an XRP token is absolutely nothing like bitcoin. Instead of needing to trust only the mathematics of proof-of-work, you can only trust the XRP token by setting up trust lines that almost inevitably end at Ripple. And while in theory anyone can set up such a server, if Ripple does not include your server in their trust lines, then you’re not part of the consensus-making process. So, Ripple is highly centralized and XRP is more akin to a PayPal account than a trustless system like bitcoin. As Peter Todd pointed out in his study, the new requirement of a global consensus protocol – which arose solely from the decision to add the XRP token – also has serious implications on scalability and security. If the token results in a more complicated, more centralized, less secure and less scalable protocol, you have to ask, why the token was added in the first place? What was wrong with the original concept, which is often compared to an electronic Hawala system, which needed no monolithic global consensus or ledger, and thus could have scaled almost arbitrarily? The original argument, that the token is needed to counter network spam is not a good one; spam can be prevented by other means, including charging transaction fees that can be paid in any currency on the network, instead of just in XRP. The other argument I hear nowadays, is that XRP would be used as a sort of reserve currency by banks or liquidity providers on the network. This seems pretty far-fetched to me; why would liquidity providers not use any other common (reserve) currency like US dollars for that, especially considering the highly volatile price of XRP ? That you don’t need a private token on a payment network is perhaps best illustrated by Hyperledger. This is a family of open-source protocols hosted by the Linux foundation, backed by a large consortium of 80 companies that includes IBM, Intel, JPMorgan and Accenture. Hyperledger Fabric in many ways resembles Ripple, but has no preferred, native token, and thus doesn’t need a single global consensus. Instead, it supports many concurrent consensus protocols, that can be localized or centralized, depending on what is needed. In short, it’s hard to come up with any rational reason why XRP exists in the Ripple protocol, other than as a means for Ripple to make money. Lots of money. 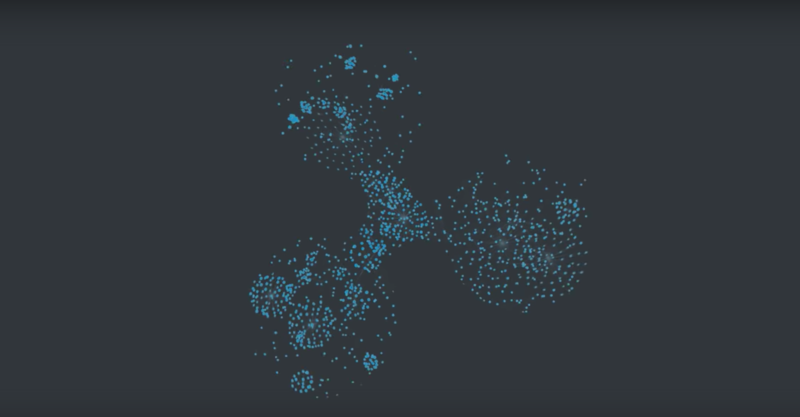 When Ripple launched, Ripple created 100 billion XRP tokens. To achieve some resemblance of fair initial distribution, they donated billions of XRP in various giveaway schemes. But the company, its founders and associated foundations, still own well over 60 billion of the 100 billion tokens. That should give any investor pause. For some reason, the existence of these tokens is also ignored by online data source Coinmarketcap, which significantly distorts the actual value of the token supply (basing market cap on “circulating supply”). These tokens are supposed to be fungible, so even if parts of them are temporarily locked up by promises or via “smart contracts” (which ironically, Ripple can’t really do), I see no reason to pretend only 38 billion tokens exist. That’s like ignoring the estimated 1 million bitcoin in [bitcoin creator] Satoshi Nakamoto’s wallet just because they are not circulating at the moment, and may never circulate. The only correct market cap for Ripple is based on 100 billion tokens, and that currently puts it at the number two spot, above ethereum. A few weeks ago, even temporarily above bitcoin, peaking above $45bn. Is such valuation reasonable for a token that serves no obvious purpose, and even seems to undermine the usefulness of the underlying protocol? Ripple investors will point to Ripple’s strategic partnerships with significant financial institutions and some ongoing experimental implementations. They will point to the 160 employees, possibly making them the largest blockchain company. They will point out the astronomical figures involved in intra-bank settlements, the market Ripple is aiming for, by presenting its protocol as an alternative to systems like Swift. Some of these points are absolutely reasonable. Ripple has highly qualified engineers working for it, that undoubtedly produce some useful code that can solve real-world problems. It also has more than credible financial backing and partners in the sector. There have been a few proof-of-concept implementations and recently Thailand’s Siam Commercial Bank announced they starting using Ripple software for Thailand-to-Japan remittance. This is a big deal, but it needs context; first of all, SCB bank is an investor in Ripple company, making it fairly logical they would experiment and promote the blockchain technology they invested in. More importantly however, I see no mention of XRP in any of the press releases. Is it being used? Or are they using Interledger Protocol (ILP)? ILP was also developed by Ripple, and appears to be a fairly impressive piece of technology to bridge between various blockchains and systems. It’s open source, hosted by the Linux Foundation and could become a part of the Hyperledger framework. But note that ILP itself has no native token; it doesn’t depend on XRP and doesn’t add value to it. Even if ILP finds wide adoption in the fintech industry, it will do precious little for XRP. As for the moonshot of replacing Swift; first of all, I highly doubt a global consensus protocol is the right approach and could even scale to that level. But also, banks currently control Swift. How likely is it they would relinquish control to a small startup and allow themselves to become beholden to its private currency, that they have no need for? I just don’t see that happening. This is especially true when alternatives like Hyperledger exist that do not suffer from Ripple’s inherent drawbacks; a protocol which is backed by a far larger consortium of corporations, which relies on proven consensus algorithms that have been researched, peer reviewed and thoroughly tested for over 15 years, and a protocol which at least at first glance, appears to do almost everything Ripple does and more, including things like smart contracts. The only obvious thing that appears missing from Hyperledger compared to Ripple, is the one thing for which I see absolutely no reason for them to want: the XRP token. Disclosure: CoinDesk is a subsidiary of Digital Currency Group, which has an ownership stake in Ripple.